1969 Event Book for 50th Anniversary or 50th Birthday. 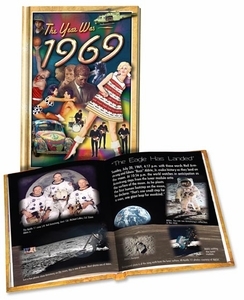 Our 1969 book is mini-sized and Contains some photos,advertisements, prices and trivia from 1969. Hardcover book, approximately 64 pp. Glossy pages, color. Makes a great birthday or anniversary gift. If you are stumped about what happened that year, this book will fill you in on all the important events and happenings. It's a great look back at our history and culture from the late sixties.